Note: You may download this resource at no cost, for personal use or for use in a Christian ministry, as long as you are not publishing it for sale. All I ask is that you acknowledge the source of this material: http://www.patheos.com/blogs/markdroberts/. For all other uses, please contact me at mark@markdroberts.com. Thank you. For hundreds of years, Christians have used an Advent wreath to inspire their hopes for the coming of Christ. By lighting candles and reading Bible verses, we are reminded about the meaning of Christ’s birth and become more excited about his coming in the past, in the future, and in our own lives. 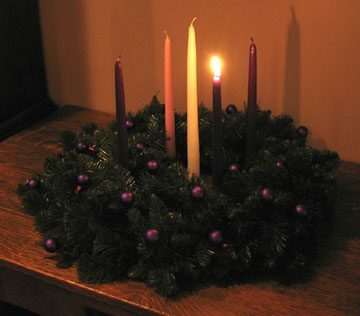 There is no set meaning for the candles of the Advent wreath (except for the middle candle, which always signifies the birth of Jesus the Christ and is often called the Christ Candle). I have been in churches where the candles point to peace, hope, joy, and love. 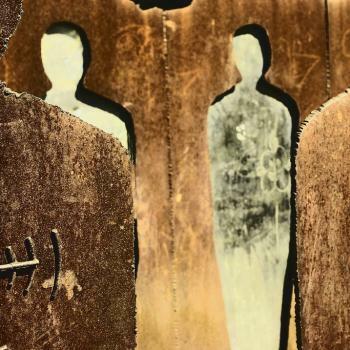 In other settings they are identified with key figures in the stories of the birth of Jesus, such as the shepherds, the angels, Joseph, and Mary. I have used the main theme of waiting to give structure and meaning to the Advent candles, with each candle focused on different aspects of our waiting. What follows is a guide for personal, family, or corporate worship that can accompany the lighting of the candles of the Advent wreath. 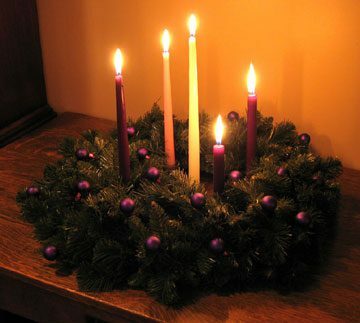 You can do this on your own with a real Advent wreath. Or you can use this guide with your family, which might certainly include close friends. All families are different, and I encourage you to adapt or to change what I suggested here . . . or do something completely original. Parents will want to make changes to fit the developmental stages of their children. Speaking of children, they have great expectations and hopes during Advent – usually associated with Christmas presents, Santa Claus, holiday celebrations, and so forth. Rather than discouraging these hopes (which is a “hopeless” task! ), I would urge parents to help their children get the “feel” of Advent by relating their hopes to biblical Advent themes. • We remember Israel’s hope for the coming of God’s Messiah to save, to forgive, and to restore. • We remember our hope for the second coming of Jesus. • We remember our need for a Savior to save us from our sins. • We prepare to welcome Christ at Christmas into our world . . . and into our hearts. By lighting one candle each week of Advent, we help ourselves get ready for the birth of Jesus. The candles have different meanings, each based upon the Bible. These meanings help us understand how special the birth of Jesus is for us. Today we focus on the coming of Christ as our Shepherd. Dear God, thank you for this season of Advent that helps us prepare for the coming of Christ at Christmas. As we read the Bible and light a candle, may excitement for Christ’s coming burn in our hearts. Amen. In this Psalm, we join the people of Israel as they invite God their Shepherd to save and to restore them. This passage looks ahead to the coming of the Lord, who will care for his people like a shepherd. Like God’s people before the coming of Christ, we also look ahead to the time when Christ, who is both the Lamb and our Shepherd, will finish his work and “God will wipe away every tear” from our eyes. We light this candle because, like God’s people centuries ago, we also look forward with hope to the coming of the Shepherd. The purple color of the candle reminds us of the seriousness of our hope. Dear God, as we light this candle, we hope for your coming as our Good Shepherd. Please gather us in your arms, feed us with spiritual food, wipe away every tear from our eyes, and “let your face shine, that we may be saved”. Come, our Shepherd! Amen. By lighting one candle each week of Advent, we help ourselves to get ready for the birth of Jesus. Last week we lit a candle that signified our waiting for God our Shepherd. Today we focus on the coming of Christ who brings forgiveness from our sins. Dear God, thank you for this season of Advent that helps us to prepare for the coming of Christ at Christmas. As we read the Bible and light a candle, may excitement for Christ’s coming burn in our hearts. Amen. In this psalm, we join the psalmist in crying out for God’s forgiveness. God promises to make a new covenant with us, in which our sins will be forgiven and forgotten. When an angel appears to Zechariah in the temple and tells him that his wife will give birth to a son, the old man doesn’t believe the angel. As a result, Zechariah is unable to speak for many months, until immediately after the birth of his son John (the Baptist). Right after the birth, Zechariah is filled with the Holy Spirit and speaks the prophecy that we will read. We light this candle because, like God’s people centuries ago, we also need a Savior who will forgive our sins. The purple color reminds us of the seriousness of our sin and our great need for God’s forgiveness. Dear God, as we light this candle, we recognize our sin and our need for a savior. We wait for your forgiveness in Christ. We long to be purified so that we might present ourselves to you in righteousness. Come, Our Savior! Amen! By lighting one candle each week of Advent, we help ourselves to get ready for the birth of Jesus. So far we have lit two candles. The first helped us to hope for God our Shepherd; with the second we asked God to come and forgive our sins. Today we remember the joy of waiting, because we know how the story ends! This psalm celebrates God’s restoration of Israel — and it cries out to God for future restoration. Through the prophet Zephaniah God looks ahead to the time when he will renew and heal his people. 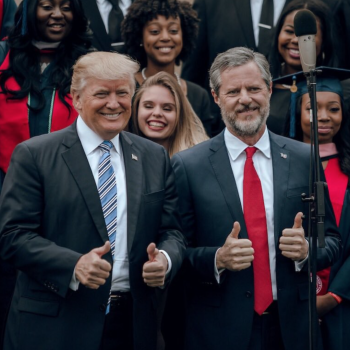 It will be a day of great rejoicing, both for them and for God! We also rejoice in the Lord, in part because we know that “the Lord is near.” This means, not only that God is with us right now, but that Christ is coming soon. We light this candle because, like God’s people centuries ago, we know that God has come in Christ and that Christ will come again. We rejoice in God’s work in history and in the future. The pink color means joy! Dear God, as we light this candle, we rejoice. We know how the first act of the story ended – with the birth of Jesus the Messiah. And we know that he will come again in glory. So even though the story isn’t over, we rejoice in our hope. We wait for you, rejoicing! Amen! By lighting one candle each week of Advent, we help ourselves to get ready for the birth of Jesus. So far we have lit three candles. The first reminded us to wait for God our Shepherd. With the second we asked the Lord to come and forgive our sins. The third, pink, candle signified our joy as we wait. Today we focus on the coming of the Son – the son of Mary, the Son of God! This psalm celebrates God’s covenant with David and with the descendants of David. He even calls God “my Father” (vs. 26). But the psalmist composed this psalm at a time when God’s blessing upon Israel seemed very far away. He calls upon the Lord to remember his covenant to David. Deliverance will come for God’s people through the “son” who is given to them. He will sit on the throne of David and his kingdom will last forever. The angel Gabriel announces to Mary that she is pregnant and will give birth to a son. Her son will also be “the Son of the Most High” and will sit on the throne of David. He will be the reigning Son of David and the divine Son of God! We light this candle because we look forward with eagerness to the birth of a child, the son of Mary and the Son of God! The purple color reminds us of how serious we are in looking forward to the Son’s birth. Dear God, as we light this candle, we look ahead with hope to the birth of your Son — the Son of David, the son of Mary. May we be prepared to welcome him with open arms and open hearts. O come now, Son of David! Amen! The Lighting of the Christ Candle: Our Waiting is Over! In the season of Advent we have used the Advent wreath and its candles to help us get ready for this great celebration of the birth of Christ. When we lit the first purple candle, we asked God to come and be our Good Shepherd. God our Shepherd has come in Jesus Christ! When we lit the second purple candle, we asked God to come and forgive our sins. God has come in Jesus Christ to take our sins and die upon the cross so that we might be forgiven! When we lit the third, pink candle, we felt joyful even in our longing for Christ to come. Christ, who has been born in a manger, will come again in glory to wipe away every tear from our eyes! When we lit the fourth candle, we remembered that Christ would come as a son – the son of Mary, the Son of David, and the Son of God! This Son has been born! He is Immanuel – God with us! Today we celebrate the birth of Jesus the Christ, Jesus the Good Shepherd, Jesus who forgives our sins, Jesus who will come again, Jesus the son of Mary, the Son of David, and the very Son of God! Dear God, as we light the center candle today, may we celebrate with full joy the birth of your Son, Jesus the Christ. Amen! God promises through the prophet Micah that his future rule will come from Bethlehem, even though this town is, indeed, a “little town” and quite insignificant. Jesus the Messiah is born in Bethlehem! Let us join the psalmist in offering praise to God for his mighty works! We light this candle with great joy and celebration, because Christ is born in Bethlehem. God’s Son has come into the world to be our Savior! And he will come again in glory. Dear God, as we light this candle, we rejoice in the birth of your Son. May we worship him, welcome him, and make room for him in our hearts. O come, let us adore him! Amen!